The mass sexual assaults that took place on New Year's Eve in Cologne and stoked anti-refugee sentiment in Germany are unlikely to occur in Canada, according to the immigration minister. 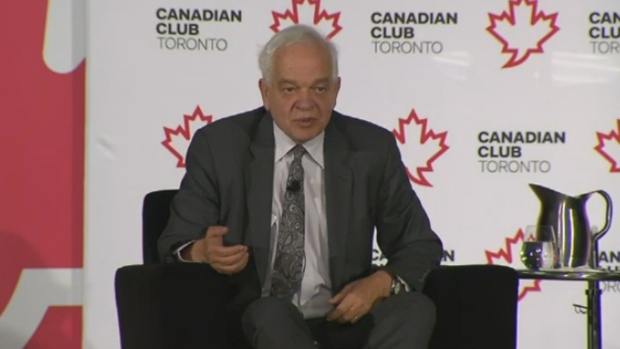 Speaking at the Canadian Club in Toronto on Wednesday, the Minister of Immigration, Refugees and Citizenship John McCallum said there are big differences in the way refugees are coming into Canada compared to the way they're entering Germany. Firstly, due to geography, Canada has the ability to pro-actively select and screen refugees destined for this country, he said. By contrast, asylum-seekers have largely been able to cross into Europe with little screening. "Germany has had a million or more people just crossing their border, any people," he said. "Instead of a million, we have 25,000. And instead of anyone crossing our border, every single one of those 25,000 has been verified for security." McCallum also noted that most of the refugees coming to Canada are families, rather than single males. "It's a totally different context. We don't take anything for granted, but we think it is unlikely that there would be a repeat of that (Cologne) situation." The minister made his remarks a few weeks after a string of attacks on women were reported in Cologne, Germany. More than 838 people have filed criminal complaints stemming from the attacks around the Cologne train station, including 497 women alleging sexual assault. The number of alleged crimes stands at 766, of which 381 are sexual offences, including three rapes, according to The Associated Press. Descriptions of the perpetrators being men of "Arab or North African" origin have fanned anti-migrant sentiment in Germany. As of Monday, the number of people accused of committing crimes in the Cologne attacks stands at 21. A 26-year-old asylum-seeker of Algerian descent was arrested Monday . He is accused of groping a woman and robbing her cellphone. During his talk on Wednesday, McCallum also said that Minister of Public Safety Ralph Goodale is developing anti-radicalization measures. "This will be a big part of our program," he said. Since taking office last November, the Liberals have resettled more than 11,000 Syrian refugees. They have pledged to resettle 25,000 by the end of February.